One of the earliest American maps to depict Lake Victoria at the source of the White Nile. In 1841.2 W. Arnaud & Sabatier ascended White River 500 leagues above Khartoum to 4 42' N. Lat. thus passing the parallel of the supposed Mts. of the Moon without seeing anything but Marshes and Low Land. Surrounding watery areas show the routes taken by numerous sailing expeditions sailing around the Cape, including Cook, Carteret, Wallis, the Resolution, Byron, Vasco de Gama, Vancouver, and others. An inset details the remote island of St. Helena, famed as Napoleon's place of exile and death. Lower right hand quadrant features two attractive vignettes depicting Cape Town and Table Mountain and Port Natal. Features the strapwork style border common to Johnson's atlas work from 1860 to 1863. Published by A. J. Johnson and Browning as plate numbers 89-90 in the 1861 edition of Johnson's New Illustrated Family Atlas. This is the last edition of the Johnson Atlas to bear the 'Johnson and Browning' imprint. Subsequent editions reflect Ward's 1862 acquisition Ross C. Browning's shares in the firm. Johnson, A. J., Johnson’s New Illustrated Family Atlas, with descriptions, Geographical, Statistical, and Historical. , 1861. Johnson's New Illustrated Family Atlas was produced in numerous editions from about 1860 to 1887. Johnson's first atlas was mostly likely the 1859 edition of Colton's General Atlas which both aesthetically and comprehensively very similar to the 1860 first edition of the New Illustrated Family Atlas. Johnson's atlas was noteworthy in its day as one of the few commercially produced American atlases that could compete with more established European Atlases. Although he called the atlas 'Steel Plate' on the title page for marketing purposes, Johnson in fact incorporated modern lithographic printing techniques and lower quality woven wood pulp paper to economically produce large format maps in quantity. He also began publishing the New Illustrated Family Atlas on the cusp of the American Civil War, a decision that proved fortuitous, as the war corresponded to a general increased interested in cartography. For the most part, Johnson's Atlas was sold by subscription; nonetheless it became so popular that for at time he was considered the largest publisher in the world. Other than the first edition, the atlas itself has no true editions. Rather, Johnson incorporated updated maps as they became available, so each example of the Johnson atlas might well contain unexpected and scarce individual maps. Johnson's map of the American Southwest, for example, appeared in more than 17 different states, each illustrating minor variations to the rapidly chasing geography of that region. Moreover, Johnson's offered a service whereby he would mail updated map pages that could be tipped into older atlases to keep them current. Generally speaking, Johnson's atlas was issued in four periods - each defined by a distinctive decorative border. The earliest edition featured a strapwork border that appears as rolled and decoratively cut leather. This borderwork remained in use until 1863. In 1864 Johnson started using an updated fretwork or grillwork border that resembles worked iron - as in a decorative fence. This border was in use from 1863 to 1869. 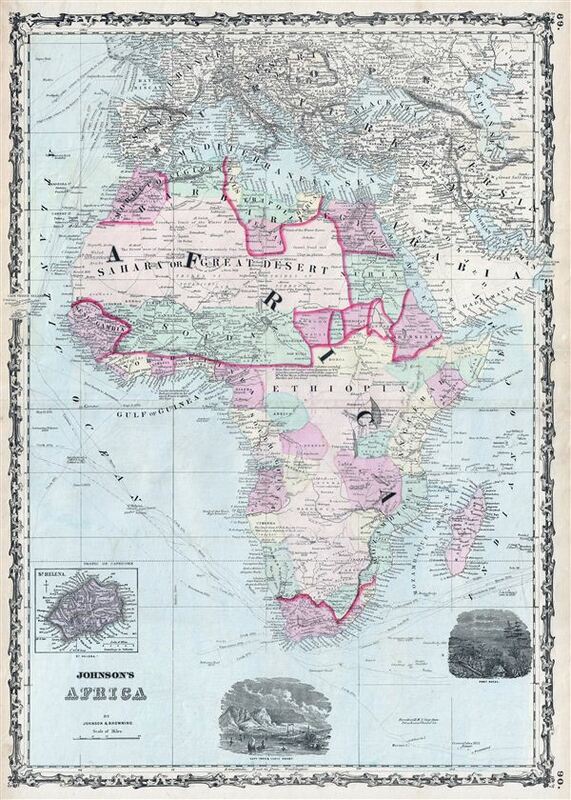 The 1863 edition of Johnson's atlas used both borders and is considered transitional. From 1870 to 1882, Johnson introduced a new border that featured elaborate Spirograph style geometric designs, which was used from 1870 to 1882. After 1880 a new border different but aesthetically similar to the Spirograph border began appearing. Certain editions of the atlas issued from 1880 - 1882 were transitional. Very good. Pencil marks on verso. Original centerfold exhibits some wear and verso reinforcement..